CRG Nation, your Cajun Rollergirls are getting ready for TWO more games in August! We’ll be in NOLA taking on the Big Easy Rollergirls‘ Second Line on Saturday, Aug. 20. 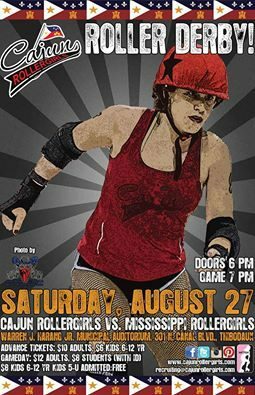 Then, we return to home sweet home – the Warren J. Harang Municipal Auditorium in Thibodaux – to host the Mississippi Rollergirls on Saturday, Aug. 27. We’ve missed skating in front of our awesome fans, and we can’t wait to see you again! Tickets are available through any CRG member, through Ticketmaster or at the door. Don’t miss the action! Hope to see you there!